Reforming the Disability Welfare State? The number of people ages 18-64 receiving Social Security Disability Insurance (SSDI) under the Old-Age, Survivors and Disability (OASDI) program has increased dramatically in the recent past. Ana Swanson (Washington Post, Wonk Blog) has brief piece that focuses on SSDI. 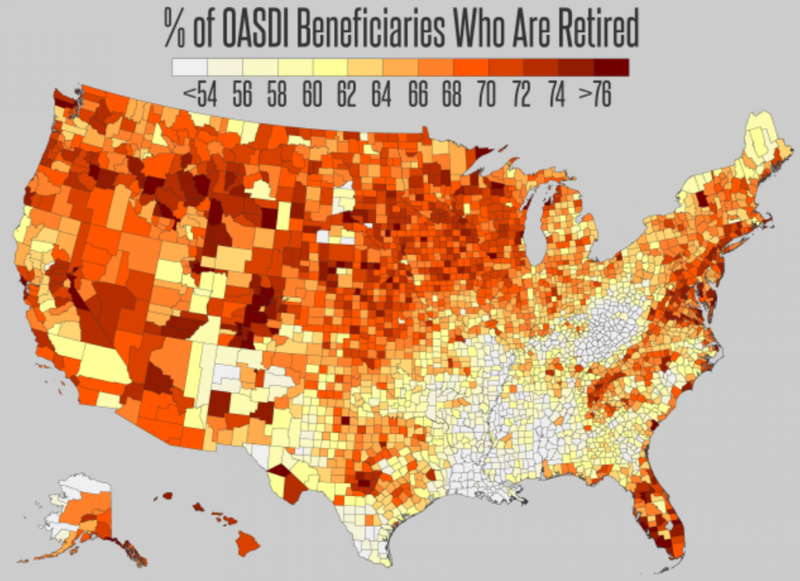 It includes a map (by Seth Kadish, Vizual Statistix) graphically representing the percentage of beneficiaries who are retired (the lighter the color, the lower the percentage retired). The expansion of disability is partially an exercise in cost-shifting in an economy that is failing to provide jobs. As Swanson notes, some of the increase is a product of aging (the older you get, the more likely it is that you will become disabled). “But it’s also due to efforts by states, often in cooperation with private companies, to move people off of unemployment benefits, which states need to pay for, and onto disability, which is a federal program.” All of this has an additional benefit: the 9 million disabled workers are not counted as unemployed. The cost shifting strategy has its limits, of course. The SSDI trust fund runs dry in 2016, which will result in a 20 percent reduction in disability payments. In the past, transfers from the larger OASDI trust fund would have covered shortfalls, thereby delaying the pressure for reform. But this week, the House GOP adopted a rule prohibiting transfers from the OASDI trust fund, suggesting that reform of Social Security Disability Insurance may finally be forced on to the agenda. While it’s easy to miss the disappearance of something, the change is glaring if you know where to look. You can see it on the House and Senate floors where, last month, Republicans uttered the word “debt” just 225 times, down from 3,188 mentions in July 2011, according to the Sunlight Foundation. You could see it in President Obama’s latest State of the Union address, which mentioned budget deficits almost two-thirds fewer times than his 2011 speech. None of this should be a surprise, of course. Election season will soon be upon us and one can be certain that no one wants to run on the promise to cut universal entitlements and/or raise taxes when there are all those hot button issues to exploit and so many babies to kiss. Just don’t tell the babies about the problems they will face in adulthood. The Motor City Mess—A Harbinger of Things to Come? Other states and cities should pay heed, not because they might end up like Detroit next year, but because the city is a flashing warning light on America’s fiscal dashboard. Though some of its woes are unique, a crucial one is not. Many other state and city governments across America have made impossible-to-keep promises to do with pensions and health care. Detroit shows what can happen when leaders put off reforming the public sector for too long. The Economist sites an interesting statistic: the total pension gap for the states is $2.7 trillion (or 17 percent GDP). In Connecticut, my adopted home state, the pension shortfall is 190 percent of annual tax revenues (Illinois is even worse, at 241 percent). Of course, this does not include the pension gap in the cities and, more importantly, the health-care benefits for state and municipal retirees. There are some obvious fixes going forward (e.g., substituting defined-contribution pensions for existing defined-benefit pensions). But this does nothing to address the current unfunded liabilities that are largely the product of politics (e.g., to win the allegiance of public sector workers, promise glorious benefits at some time in the future when someone else will have to foot the bill). As recent events have revealed, efforts to force reform can carry high political costs. When one considers the huge unfunded liabilities at the federal level, the additional problems in the states and municipalities may prove even more difficult to address. It is hard to imagine the federal government providing much in the way of assistance when it is being forced to draw increasingly on general revenues to cover its own obligations. President Obama’s budget proposal supports entitlement reform, in part, through the introduction of the chained CPI (rather than the current CPI-W) for calculating cost-of-living adjustments. This change has been part of various reform proposals over the years, although it has often been discussed as part of progressive indexing (i.e., maintaining the CPI-W for low wage workers, thereby increasing their Social Security payments relative to those with higher incomes). This proposal has usually attracted the ire of those on the left, who view it as a cut in Social Security rather than a reduction in the trajectory of growth. Although the Club for Growth is not pleased with Walden’s critique, at least he has gained the support of the AFL-CIO, as the National Journal reports. The GOP leadership may discipline Walden. But if Walden’s comments signal the GOP’s intention of opposing reform in hopes of winning some additional seats in 2014 and undermining the Democratic Party’s claim of protecting seniors, one can predict that entitlement reform will be kicked down the road once again. There was little that I found surprising in President Obama’s second inaugural address (if you didn’t watch it or have a chance to read it, you can find it here). He clearly articulated—however vaguely—a center left agenda, much as one might have predicted. Unless the Democrats capture the House in the 2014 midterms, I don’t see a set of circumstances that would result in major progress on any of the big-ticket items. As I have noted in many past postings, the challenges posed by our entitlements is nothing short of daunting. The dates for the insolvency of the various trust funds have been moved up in recent years (with the disability trust fund slated for insolvency by 2016, the last year of President Obama’s second term). The passages above reinforce my existing concerns that there will be little if any progress on entitlement reform in the next few years. The President’s rejection of a tradeoff between “caring for the generation that built this country and investing in the generation that will build its future” ignores an important fact. The status quo guarantees that the “generation that will build the future” will also have to bear an enormous tax burden to cover the costs of the baby boomers’ pensions and health care. 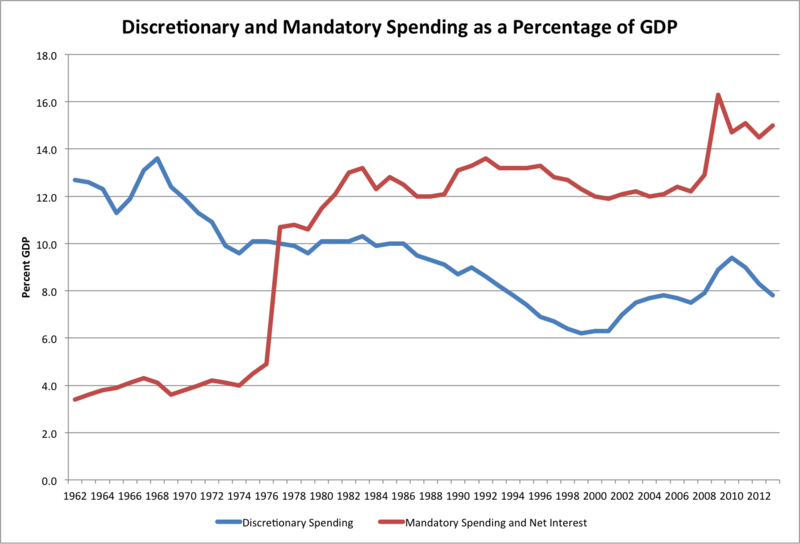 These costs and the costs of servicing the debt will squeeze out much of the discretionary spending for the very programs that the President finds so attractive. Of course, the President may believe that the trust funds could be made solvent if only the rich paid their fair share. If this is the case, the President’s claim that we need to “revamp our tax code” may be shorthand for significant increases in marginal rates. More likely, the President believes (like his predecessor) that entitlement reform is best left to a future administration that will have no choice but to face the tradeoffs that he rejected in his inaugural address.